The final report on our study of learning analytics for European educational policy (LAEP) is now out. 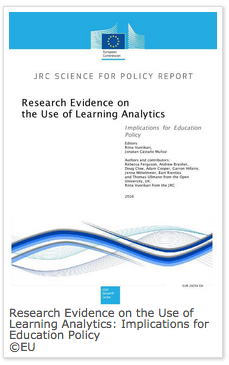 Research Evidence on the Use of Learning Analytics: Implications for Education Policy brings together the findings of a literature review; case studies; an inventory of tools, policies and practices; and an expert workshop. The report also provides an Action List for policymakers, practitioners, researchers and industry members to guide work in Europe. Other resources related to the LAEP project – including the LAEP Inventory of learning analytics tools, policies and practices – are available on Cloudworks. This entry was posted on January 13, 2017, 10:46 am and is filed under Analytics, Educational Futures, Esteem, Funding, Publications, Reports. You can follow any responses to this entry through RSS 2.0. You can leave a response, or trackback from your own site.